Becoming minimalist is a lesson in compromise and discipline. 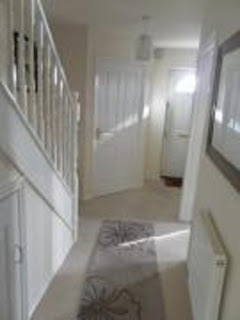 When we moved to our new house in June the hall was carpeted in cream and was a nightmare to keep clean (well we gave up); especially as June and July were so wet here. We put aside money from the house sale to make necessary changes to the house and planned to spend this wisely. In the first month we had the loft boarded and a wooden pull down ladder installed. Re-flooring the hall was the next big change we wanted to make. We would have loved a solid oak wood floor but the estimates we got were too expensive. I was disappointed and tempted to blow the budget and get a real oak floor somehow/anyhow (DIY wasn't an option due to lack of skills and a conscious decision not to spend too much time on house projects). In the end I gave myself a hard talking to: "You are on a lower income and have to stick to a budget. You have no credit card debt and some savings BUT A SOLID OAK FLOOR IS OUT OF YOUR BUDGET!" This is how I have changed as a wannabe minimalist. A few years ago I would have had that wooden floor - I have been an interiors obsessive and I still get these grand illusions from time to time (for e.g. that solid wooden flooring is the best option and it has to be German). Now I know that a hard floor is a hard floor and that buying the most expensive won't necessarily be better or even more stylish. Also, if you stick to your budget there will be no guilt and still money left in the bank. Eventually we went for the best man-made alternative that we could find. We chose Karndean (big in the UK) and chose a reputable local company to fit it. It has a 20 year guarantee and should last longer. It cost about half the price of solid wood flooring and we could also afford to have it laid through to the downstairs loo. We are pleased with the look that the new flooring brings to our home and with the quality of the fitting. The colour ('Dawn Oak') is warm and welcoming and isn't high maintenance in the cleaning department. And it looks like real wood! 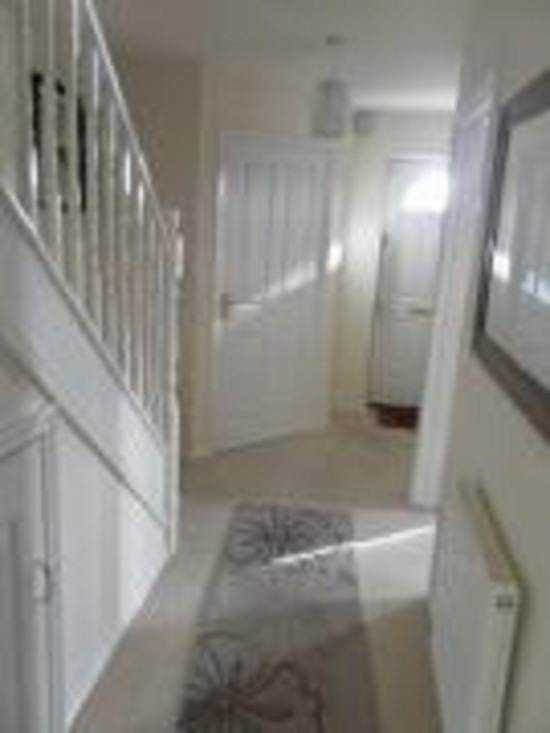 The estate agent's pic of before. ◊ If you are renovating/making alterations to your house set a budget that you can afford. ◊ Decide which changes will have the biggest impact on you home in terms of looks, maintenance and lifestyle. ◊ Get the most important and most expensive jobs done first. ◊ Take time to consider before you buy. Is it too fashionable? Will I tire of it? ◊ Accept that you can't always afford what you desire/aspire to. ◊ Make a decision not to get into competitive house improvements - do you want shallow friends who only like you because of your taste/flashy house? ◊ Although not as eco-friendly as natural products, man-made products can be ethical if they are bought to last a long time. ◊ Buying from a local independent supplier supports the local economy and therefore makes you feel good. ◊ Get the best quality of product and fitting that you can afford. How about you? Do you sometimes put yourself under pressure to buy 'the best'? Well said. I too have wasted too much money in the past by compromising and not waiting until there were sufficient funds to buy to last.